The strongest plastic Foldable Large Container (FLC) at unbeatable conditions !! Today we want to bring to your attention a quality load carrier which can add value to your supply chain because of its great features and benefits as well as its temporary extra-ordinary low price. This 1200x800x960 mm plastic Foldable Large Container, is the strongest foldable pallet box on the market. The euro size FLC is a perfect alternative for the metal Gitterbox. Made from durable HDPE and food safe for some applications, it is very easy to handle and strong for a high payload till 900 kg. The plastic pallet box has non-sequentially foldable side walls which is very user-friendly. The durable HDPE makes it an environmentally green pallet box. Because of its reduced folded height and the use of materials that are fully recyclable, the GitterPak contributes to lowering CO2-emissions and your carbon footprint. The GitterPak was designed to better protect and transport parts in global automotive and industrial applications by eliminating the need for steel stillages, gitterboxes or wooden crates commonly found in automotive/industrial packaging systems. 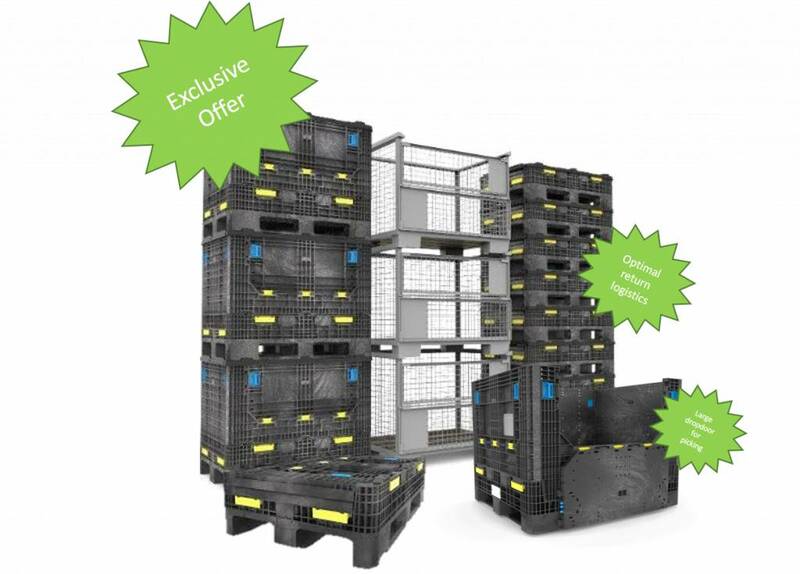 For all your applications , this multi-purpose ‘product in the spotlight’ plastic pallet box is the best deal you can have on the market today. Now available in the Contraload Webshop for an exceptional introductory price until 31/03/2018. Ask us and get it if you need it!